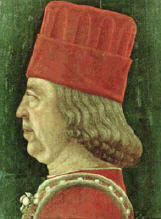 This is the first Trionfi production under the reignment of Borso d'Este, his brother Leonello had died in October 1450. Although it might be assumed, that Leonello took an excessive influence at the origin of the 5x14-deck, it must be stated, that he showed no great interest in the development of the game. It was Borso who engaged with many actions in the production of Trionfi decks. But in the art activitities at the Ferrarese court this probably played only a minor role. One main product under Borso was the dscalled Este Bible, perhaps the most expensive book of all times, created in 5 years between 1455 - 1460. Another famous object became the Palazzo Schifanoia and its decoration with an astrological scheme of the antique astronomer Manilius. Maistro Iachomo de Sagramoro depintore de avere adi XXIII de agosto* lire quarto de marchesani per sua mercede de avere depinto a tute sue spexe uno paro de charte da trionfi da lato drito per uxo delo Illustro nostro Signore; domanda lire 5 de marchesani e Galeotto gie tassa lire quarto de marchesani …………..L. IIII. [Franceschini 1993 n. 663i (p. 355)] * Franceschini gives the date as 22 August, while his edited text says 23 (XXIII) August. Maestro Jacomo de Sagramoro, painter, having the 22nd day of August four lire marchesane for his recompense, for having painted at his expense the face of one pack of triumph cards, for the use of our Illustrious Lord; asking 5 lire marchesane and Galeotto gie tassa lire four marchesane ……………….. L. IIII.